Well first of all, I hope it's only the XD card that's playing up with the colours that are coming up and not the camera. Anyway, I thought I'd put some pick ups on this because it uses the pinpoint axles and bearings and they don't seem to work very well. You can probably see that I've put in a Zimo SC68 stay alive but I'd sooner not have to use it. I had the body off, weight out, motor out and can only see that I'd have to cut the brake gear off (as I did on the Beattie Well Tank, also made by Dapol). Or am I missing something. Has anyone else got one and has been able to do this, what should be a simple job ? Here it is. Any chance of a look at the chassis? Are those axles being used with the pinpoints in the outside frames? I can try for what it's worth, but as I said, it is pin points and that's what it relies on for pickups. It's so tiny that I couldn't possibly get a soldering iron in there without doing a lot of damage. Just a decent upside down close-up. I'm just interested, seems a bit daft to have this sort of design. How do you keep it clean? I presume these are split axles and live wheels. Hopefully not a split chassis. Alan Gibson type plungers work well in tight spaces, and you hace all that wheel to work with by the look of things.. You could always resort to a whisker running on the upper tread surface. Well here we go, but I don't think it'll help much. Yes it is split axle but not split chassis. I should have put something like a 10c piece beside it for scale, but those wheels are tiny, 10.5mm. I used a light and the flash with the camera set to macro, but being all black it was really difficult to get a decent shot. Anyway, it's here. Interesting. How much lateral slop is there and are those wheels in gauge? 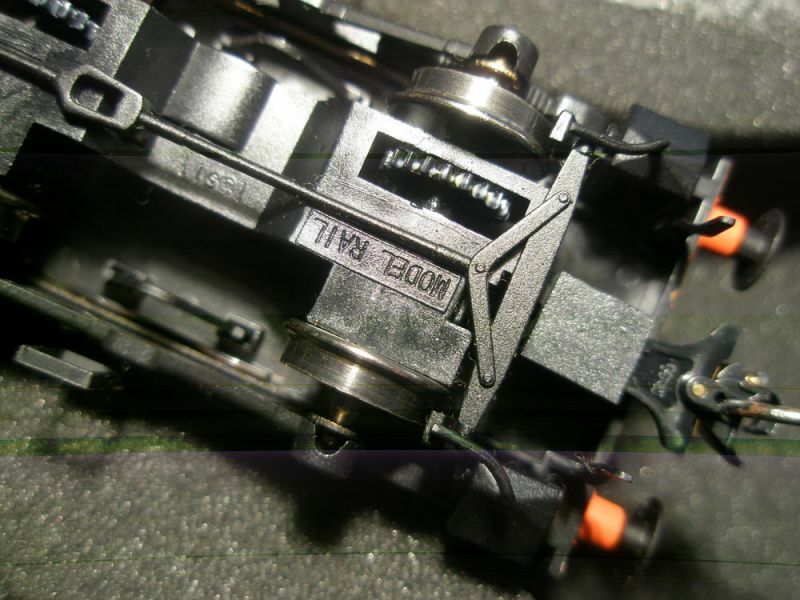 Electrical continuity will be between the upper surface of the axle and the contact with the bearing (assuming the manufacturing tolerances are correct and the slopes are the same), some additional weight would make sure the contact is maintained over rough spots. I would solder whiskers to the p/b arms if you can get them out and have them contact the axle inward of the axle cone, or the front face of the wheel. Or the wheel tread surface. 10 or 15 thou' p/b wire should be fine. You could also mount some brass strip across the chassis for p/b wires. I suspect more weight and in gauge wheels will help unless there is excessive slop in the cones. Difficult to regauge split axle designs unless it is a really tight fit. Can be done with packing discs the same diameter as the axle. Wheels are in gauge and absolutely no way to get more weight in, it's as full as a boot in there except for where the decoder and SC68 along with associated wiring is. No way to get those pb arms out without cutting the brake gear etc, not that I can see anyway. 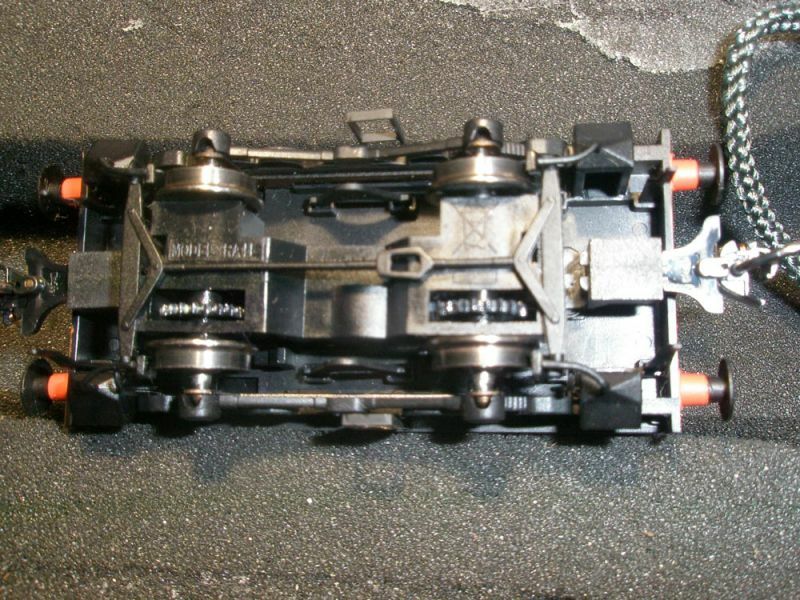 I can see that the chassis comes apart in the same way as the old Hornby tender drives which to prise it apart with a screwdriver and brute force. It's looking as though I'll have to get cutting. Thanks for the help Nigel. I've just found out for sure on the Ultrascale site. The brake gear does have to be cut away. At least I can get on with it now. 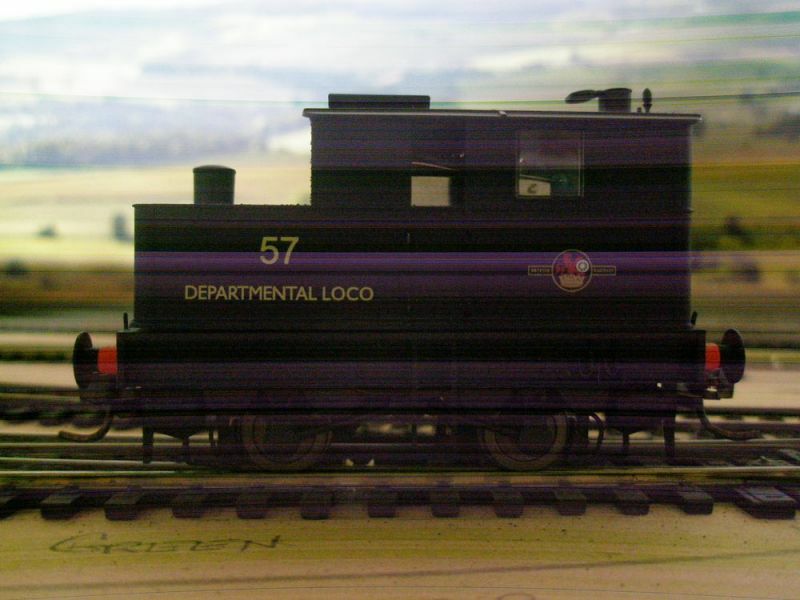 Pete, I have the same loco and it runs perfectly. Why not contact Model Rail with a view to returning it for a replacement? It's quite a long time ago now and I've cut the eight pin plug out of it to hard wire a decoder. It also costs plenty to send something like that from Oz, so it's fix it or leave it. I think I might get it apart tomorrow. I did it with the Dapol Beattie Well Tank, so this'll get the same treatment now that I'm sure what to do. A bit of brute force and ignorance was called for and out it came. I used a pair if long nosed pliers and pulled out one of the supporting legs for the brake gear. The other three parted down near the bottom ( the top when it's the right way up) but they'll be no trouble to glue back once I've done the job. I thought I might as well do it so into it I got stuck. I had to build part of the chassis out with plasticard to give something to glue the strip on one side. I'll be taking the wheels and axles out again when I get some Loctite as they're loose in the axle muffs... why couldn't they have been splined ? It now runs nicely without the stay alive cap and circuit cluttering up the cab. Spoke too soon. I took the wheels out again to glue the steel axles into the plastic muffs and then realised why they were loose... both of them at the far end to the gear were split ! I glued them in anyway and clamped the axles at the splits, but they're both swollen so It now runs a hairy goat. To be honest, I'm fuming because this loco has spent most of it's life not being used because of the poor pick ups which I've now fixed. I've written to Dapol (it was one of the original offered by Model Rail, but made by Dapol) and asked if they'll send me a new set of wheels. I see that another release came out late last year, so I'm keeping my fingers crossed. Has anyone else had this, or am I the only one? Split axles? There really is no excuse for this. Expect it on old models before the source of the problem was known, not now. Hopefully a new set is in the mail. No such luck. I had a reply from Dapol telling me that I should contact the Kernow Model Shop, which is where it was purchased or Model Rail who commissioned them. Nice hand washing exercise don't you think. This coming from the manufacturers! Then I think an email to Ben Jones is called for. I know of Dave Jones who now runs DJH Models. Is Ben Jones a boss at Dapol nowadays? Ps: There's plenty of Jones' in Wales. The only Ben Jones I am aware of in the UK model scene was the past editor of BRM magazine. Aah, that'll be Jones the cop, but then there's Jones the milk, Jones the bread, Jones the coal, etc. So you can see how people get discombobulated. I've written today to the Kernow Model Shop and wait to see what they say, although with the new release that, as I said, came out late last year (November) I'd hope to be able to get a couple of spares - surely they'd do a few spares? If not, what are we supposed to do if something goes wrong with a model that's out of warranty as this one is but is otherwise, apart from a small part, quite serviceable. I didn't realise when I bought this that it had split axles and might have made a different decision if had. You are here: Your Model Railway Club > More Practical Help > Members Projects > On Members Workbenches. > Can anyone help.